Laying in bed this morning I forced my eyes open awakened by my alarm…I was a tad disappointed because I usually wake up 10 minutes prior to my alarm. I was not incredibly surprised because I was fully aware of the Golden Girls binge that forced me to stay up too late last night. I believed that wasn’t all I was supposed to read this morning so I decided to flick my finger through my Bible app on my phone with my eyes closed to find what would be good. A little more challenging, navigation-wise, than just opening up a hardcover Bible…but ultimately less challenging because it did not require me to get out of bed. Conviction moment: people struggle every day just to be able to do what I am doing with very little effort. I ended up on 2 Peter, Chapter 2. My reflection: YOU CAN’T GO BACK. No matter how enticing and easy. You cannot go back. I felt pretty good about it as I finally crawled out of bed…despite the fact that such text could be perceived convicting and dark–it also can be affirming and light. The first music video that was played was one I had surprisingly never seen. Why was it surprising? 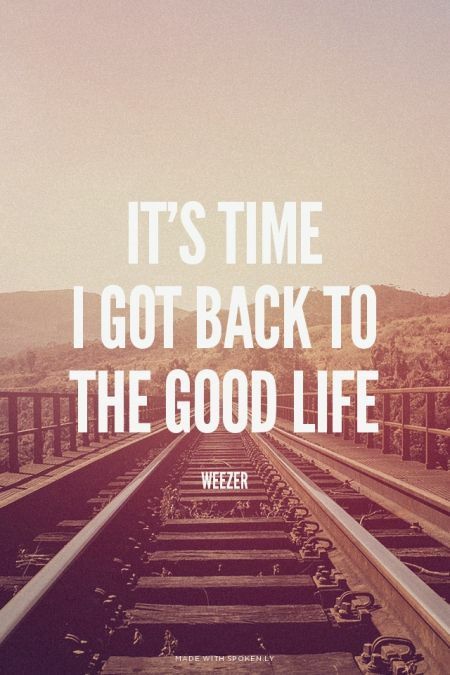 Well, it was just one of my favorite jams of all time, that’s all…GRACE please, it was Weezer’s The Good Life. Familiar crunchy guitar riffs that excite my senses and take me back to another decade. So I quietly sang every word as I waited for my coffee to brew. I was slightly intrigued by the “DELIVER ME” skywriting 3 minutes into the video. Tell me, who’s that funky dude starin’ back at me? But who do I got to blame? I wanna go back, yeah! Are you seeing where this is going? If so, I am going to guess that you’ve already had your coffee kick in. For me, this blog wasn’t inspired until way into my shower-time as I was still singing The Good Life. Most of my blog inspirations arrive while I’m in the shower or toweling off…Too much information? Sorry, must be said–if God is speaking to you while you’re in the shower–you should listen take His direction…where else are you more naked and clean before God than in the shower? Where else are you more isolated and free of distractions? The shower–the ultimate prayer closet–like nobody is allowed in there with you–you might even lock the door to keep people out–but you’re not alone. YOU CAN’T GO BACK. No matter how enticing and easy. You cannot go back. To pursue “the good life” you cannot go backwards. Moving forward is the only option for “the good life”. 20 If they have escaped the corruption of the world by knowing our Lord and Savior Jesus Christ and are again entangled in it and are overcome, they are worse off at the end than they were at the beginning. 21 It would have been better for them not to have known the way of righteousness, than to have known it and then to turn their backs on the sacred command that was passed on to them. I understand the temptations and thoughts that bring us to the place where we want to say “screw this crap, I’ve had it” and “I wanna go back”. But I truly believe that you can’t go back to that place. It’s not the same, that vomit will not taste the same…though it might be harder to stop eating it. If you do go back and wallow in the muck…don’t get so messed up over it that you fail to fall on your face and trust in His grace. We all have vomit, we all have muck. I’m not going to define my muck today, and I’m certainly not going to point out your vomit. Let’s just acknowledge that there is individualized user-defined muck all around. I know the old muck that I should avoid, I’m aware of the vomit that I shouldn’t return to. Thinking on the “DELIVER ME” skywriting message in the sky. Is it unreasonable to suggest when we are longing to go back to our own vomit that we just look up to the sky and express DELIVER ME? I think that is an appropriate course of action. Help me avoid the vomit, DELIVER ME! I’m just thankful that it wasn’t El Scorcho that I had to write about–I’m not even close to being ready to address my El Scorcho issues in front of the world.